I cannot believe I haven't written about Salon International de l'Artisanat de Ouagadougou (SIAO), and it's already finished! 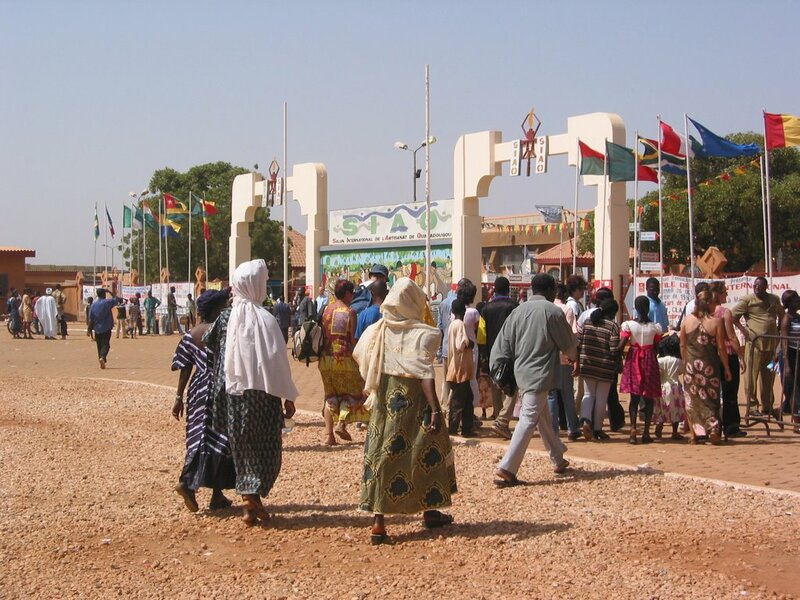 The 10th SIAO (International Arts and Handicrafts Trade Show of Ouagadougou in English) was held Oct 27-Nov 5, 2006. An estimated 2,500 artisans and 500,000 public visitors attended. This year's theme was "African handicrafts and fair trade." The first one was held in 1984 and allowed the government to assess the interest in Burkinabe products by Americans and Europeans. It was a success so the first edition was held in 1988. Since then, the show is every even year, starts the last weekend of October, goes for 10 days, and features crafts from many African nations. Handicrafts available include bronze statues, hand-woven textiles, leatherwork, ethnic jewelry, colorful pottery, ceramics, calabash toys and many more. I have only been to 1 SIAO, in 2002. This is where I first met Sidonie and bought my 1st of many Sidonie bags (a yellow one with purple embroidered flowers). It was awesome to see all the different handicrafts and works of art from around the continent. One of my favorite purchases was a hand painted gourd by a Burkinabe artist; he made some of his pieces right on the spot. I had a lot of fun wading through yards and yards of Mauritanian fabric as well. I felt like a kid in a candy shop! Local eats were also available, and different dance troupes and musicians performed. It was a very festive environment. I'm pretty bummed that we weren't able to go this year, as planned, considering this year's theme. But, we have it on our calendars for 2008! Vous être invite. Unfortunately, you didn't miss much at SIAO this year! Despite this year's "fair trade" theme, they raised the prices of booth rental to ten times the norm - making it almost impossible for most artisans to attend. Instead, there were more dealers pushing your typical array of tourist objects.